Maple Leaf Foods, the biggest meat producer in Canada, is on a mission to become the most sustainable protein company on Earth. Since traditional meat production and sustainability don’t go hand-in-hand (to put it lightly), Maple Leaf is looking to the future of protein: plant-based meat. In a $120M deal, Maple Leaf has acquired Field Roast Grain Meat Company. This follows Maple Leaf’s acquisition of Lightlife in early 2017. 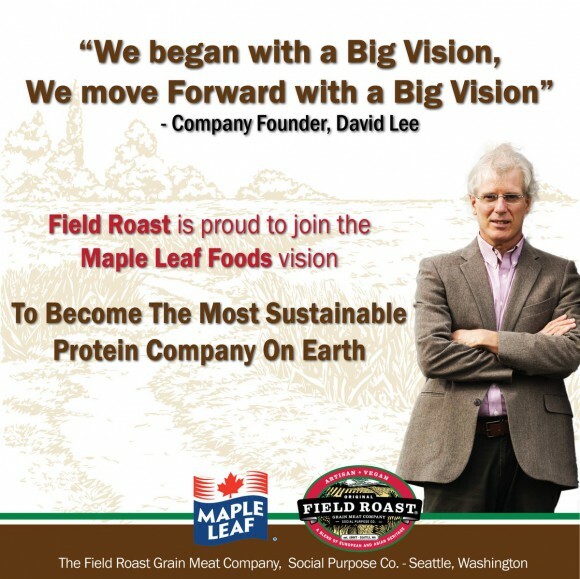 By adding Field Roast to its portfolio, Maple Leaf has become a leader in U.S. market share for refrigerated plant-based proteins – a market currently delivering double-digit annual growth. At The Good Food Institute, we believe that transformation of the food industry can happen from the inside out, with market forces and food innovation driving the development and adoption of healthy, humane, and sustainable plant-based meats that will make factory farming obsolete. To accelerate this transition, GFI works with mainstream protein companies like Maple Leaf Foods, offering overviews of plant-based and clean meat technologies, venture capital and investment opportunities, and market & consumer research. You can learn more about our team’s work here. And to get to know Field Roast and their their delicious products, read our interview with the company’s founder, Chef David Lee!